Margot Robbie set hearts racing as she stepped out on the 2017 Gotham Independent Film Awards red carpet in a striking Saint Laurent ensemble that oozed sultry edge and vampy glamour. The Australian stunner wore an emerald one-shoulder dress that featured sequin embellishments, a draped detail, a belted waist and an asymmetrical side slit detail. She styled it with tousled waves, a dark red lip, a Roger Vivier cigarette case and black velvet sandals from Saint Laurent. Margot Robbie at the 27th Annual Gotham Independent Film Awards held in New York City, on November 27, 2017. 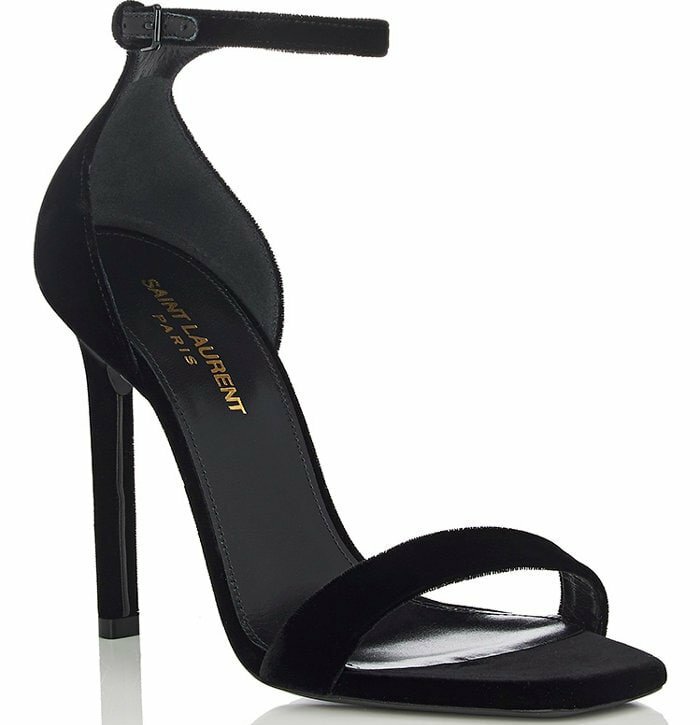 The “Amber” sandals come in lustrous black velvet and feature open square toes. 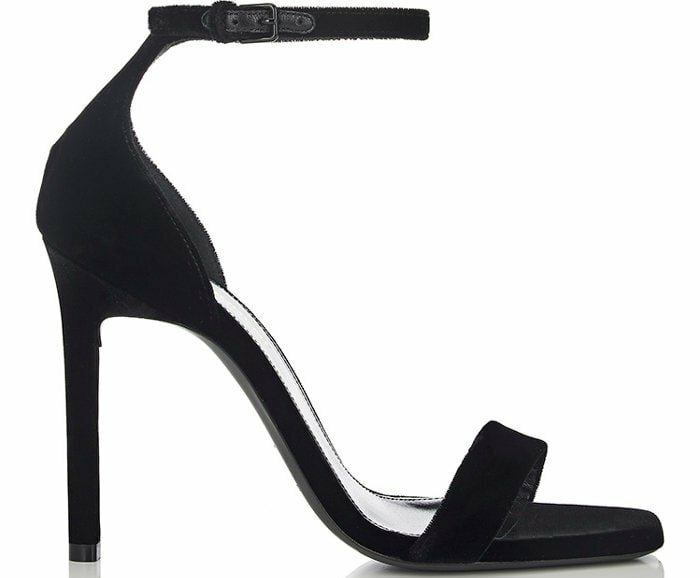 These shoes also have buckled ankle straps, leather lining and covered stiletto heels. Get your own pair for $795 at Barneys New York. Following her appearance at the awards ceremony, Margot attended the New York screening of “I, Tonya” at the Village East Cinema in an effortlessly cool look from Calvin Klein 205W39NYC. Co-star Sebastian Stan, who looked handsome in his velvet and moire silk suit, joined her on the pink carpet. For her premiere look, Margot wore a Western-style white lace blouse (available at Neiman Marcus) paired with white floral lace pants (also available at Neiman Marcus). She toned down the sheer sultriness of her lace ensemble with a gorgeous brown suede coat. A chic updo and Calvin Klein 205W39NYC black pointy-toe pumps rounded out Margot’s stylish look. Margot Robbie with Sebastian Stan at the “I, Tonya” screening held at the Village East Cinema in New York City, on November 28, 2017.